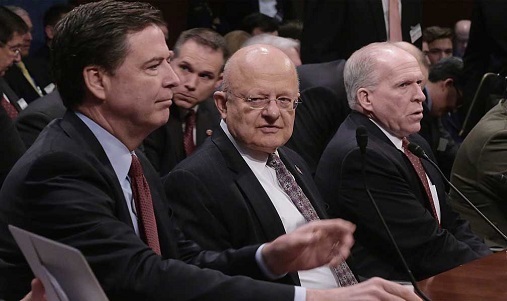 Three Deep State minions: (left-to-right) Former FBI Director James Comey; former Director of National Intelligence James Clapper; and former CIA director John Brennan. Rather than being professional intelligence experts, they worked for Obama as his personal snoops. Despite the U.S. Department of Justice (DOJ) officials patting themselves on their backs for finally releasing documents and copies of applications for Foreign Intelligence Surveillance Act (FISA) courts warrants to criminally investigate Team Trump after the election, there may be more work to achieve true transparency. On July 19, 2017, a top government watchdog filed a Freedom of Information Act (FOIA) request with the officials at the Justice Department — including Assistant Attorney General Rod Rosenstein — for copies of the applications it submitted to the Foreign Intelligence Surveillance Act for warrants linked to the alleged Russian-Trump Campaign Collusion in the 2016 election. Although the Democratic National Committee (DNC) loudly complained their computers were “victims of information theft by hackers,” it wasn’t until Hillary Clinton lost the presidency to non-politician Donald Trump that suddenly accusations were flying throughout the Beltway Swamp. Trump must have cooperated with Russian President Vladimir Putin to bring down Hillary Clinton. As is usual with the federal government, Justice Department failed to comply. Whats more, the DOJ refused to confirm or deny any such documents even existed. But then, earlier this year, President Trump declassified the controversial “Nunes Memo” which discussed the Carter Page (FISA) warrant abuses. As a result, the group Judicial Watch quickly sued as the FISA material could now be made public since it was declassified by POTUS. In April 2018 the DOJ told the judge that it would turn over requested material by July 20, last Friday. In didn’t happen. However, late on Saturday, Justice Department released a heavily redacted 412-page document. “Despite the fact that most of the pages were blacked out, they seemed to confirm that the FBI and DOJ misled the courts in withholding the information that Hillary Clinton’s campaign and the DNC were behind the ‘intelligence’ used to persuade the courts to approve the FISA warrants that targeted the Trump team,” according to a Judicial Watch email to Chief of Police Magazine. “The use of unsubstantiated evidence to back up a search warrant request is understood as being a no-no even to a young police officer right out of the [Police] Academy. Don’t FBI agents know that? Don’t Justice Department brass like [Rod] Rosenstein know that?” – Det. Sgt. William Dannen. 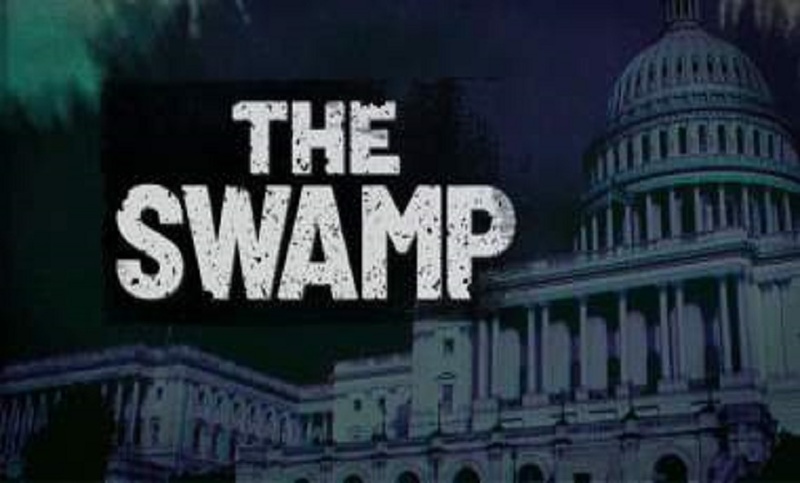 The FISA court judge wasn’t informed that the most important part of the information for the warrant requests came from a “dossier” that was created by Fusion GPS, a paid firm used by the Clinton campaign and Democratic National Committee to “dig up dirt” on Hillary’s Republican opponent.. The first of several Carter Page warrants was granted just weeks before the November 2016 election. Page had worked on the Trump campaign team as a part-time advisor. He became the subject of four controversial FISA warrants from the DOJ. The strategy was that since Page was using campaign office communications, that opened the door for FBI surveillance on those who spoke to Page and those who used Page’s telephones or email address. “Little wonder, then, that Justice took a year to deliver and then waited until a Saturday evening to release the materials,” said Tom Fitton, President of Judicial Watch. “The documents [we obtained] support criticisms by Republicans on the House Intelligence Committee who released the Nunes memo that criticized the FISA targeting. The memo details how the ‘minimally corroborated’ Clinton-DNC dossier was an essential part of the FBI and DOJ’s applications for surveillance warrants to spy on Page,” Fitton said in his email. Fitton was pleased with Judicial Watch’s work becoming widely acclaimed by Fox News Channel, NewsMaxTV, One America News Network, and the Cable Radio Network and was noted five times by President Trump, who tweeted: Congratulations to @JudicialWatch and @TomFittonon being successful in getting the Carter Page FISA documents. As usual they are ridiculously heavily redacted but confirm with little doubt that the Department of “Justice” and FBI misled the courts. Witch Hunt Rigged, a Scam! “Given the corruption made evident by the document, President Trump should intervene and declassify the heavily redacted material, as I call for here. The Obama/Deep State’s abuses now lie partially exposed, and it’s important for Americans to see the full evidence,” said Tom Fitton.